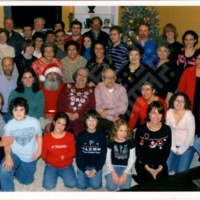 The El-Khouri, Jabaly, and Isaac families pose for a photograph together in a living room during the Christmas season (Folder 2-27). The Shivers and other El-Khouri family members stand in front of the Dean E. Smith Center to celebrate Thomas Isaac's graduation (Folder 2-17). Two variations of photographs taken of Joseph with his seven children in a swimming pool during the El-Khouri family vacation to Miami, Florida. The trip was taken in part so that Joseph El-Khouri could attend the 1963 Lion's Convention. A photograph of the taken of the seven El-Khouri children at the Seaquarium in Miami, Florida. The trip was taken in part so that Joseph El-Khouri could attend the 1963 Lion's Convention. Family photo depicting George El-Khouri with a cat on a lawn chair at the El-Khouri and Jabaley Father's Day Celebration in Andrews, North Carolina, 1965. The El-Khouri, photographed in 1963.